In Ready or Not, Here I Come, Schoolhouse Rock taught us just how much fun counting by fives can be. Today, Nice Price or Crack Pipe knows you can count on a BMW 5-series to bring the fun. It's because of his driving the snakes out of Ireland that we celebrate Saint Patrick and dye the Chicago River green once every year. Equally celebratory was our 1981 DeLorean which yesterday 67% of you proved content to drive out of just about anywhere. While that gull-wing coupe really seemed to shamrock your world, it still was a car built upon compromises. The engine wasn't the first choice, the chassis was a late addition designed by Lotus, and St John the Dealer compromised his ethics in a failed attempt to keep the whole shebang afloat. In contrast, today's contender is intransigent in delivering the purest expression of its purpose. When Goldilocks perpetrated a home invasion robbery attempt on the three bears, her plan was foiled by the Ursine homeowner's early return, and her own compulsion to sample every option of the bear's household accouterments despite always settling on the middle one as just right. While even Goldilocks would agree that the car with the most horsepower would usually be the preferred choice, today's BMW 535is fills that middle ground so favored by the trespassing blonde, and it too might be just right. Further extrapolating on the concept, the 535is is Jan Brady to the M5's Marsha, with the standard 535i playing the role of the pig-tailed and extremely annoying Cindy. While Marsha is the aspirational choice, you know she'd be high maintenance, and would eventually leave you broke and horny. Jan, on the other hand, swims in the same gene pool giving you 80% of the Full Brady Experience without quite so much wallet drain and drama. 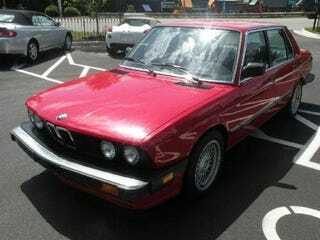 That's why this '87, with its 182-bhp M30 B34 3,430-cc six and sport suspension is such a good choice. Sure, it gives up a little more than 20 ponies to the M5, but the SOHC motor is simpler, and cheaper to maintain than the M's 24-valver. With the Getrag 260/6 five speed - as is equipped in this car - it'll top out at over 130 mph, and handles nearly as well as the M.
The 535is also gets the M5 body kit and sport seats, so it looks the part. Although, while its suspension is upgraded over the i, it's not the same as the M, and it doesn't get its big sister's 4-pot brakes. As the E28 edition of the M5 was only available for a single model year - 1988 - you can see why the unique parts for that car would be more dear. Inside and out, this 143,500-mile E28 looks both clean and complete, including the dash which typically in cars of this age have more cracks than a plumber's convention. As these cars are pretty quick, the arrest me red paint may not be your first choice, but at least it's shiny. So what does Jan cost these days? Well, this dealer-offered example has an asking price of $7,995. For that, you're getting two-thirds of the way to Marsha, without having to put up with all of her crap. You're also getting one of the last of the shark-nose boxy bimmers that seemed to define the brand until Chris Bangle arrived and brought with him a can of car style from Fugs Я Us. Oh, and you get a cool boot-lid mounted tool kit to boot. How about that price? Does a lincoln shy of eight large make you want to adopt this middle child? Or, for that price, would you rather see Alice naked? Raleigh Craigslist, or go here if the ad disappears. Hats off to rusty735 for the tip.